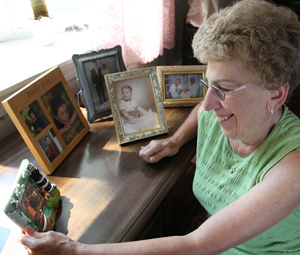 Over forty years ago, Catholic Charities welcomed Priscilla when she was young and pregnant. Faced with a very difficult decision Priscilla ultimately felt in her heart that adoption was best for her newborn son. She gradually moved on with her life, married, then returned to Catholic Charities to adopt an infant girl and boy. Recently, Priscilla’s adopted adult son was contacted by Catholic Charities to consider a reunion requested by his birth parents, now married with a family of eight. Their reunion embraced Priscilla who has become a vital member of her son’s loving birth family. Her son’s birth mother shared the story of her own search. This encouraged Priscilla to start a search for her biological son. Welcomed again by a Catholic Charities social worker and with her help, Priscilla began her search. On February 14, 2009 Priscilla joyfully reunited with her son to whom she had given birth 43 years earlier. Priscilla says the reunion was more than she could have ever hoped for. Her son was equally excited about reuniting with the mother he had known about, but had never known. Today they still keep in touch, corresponding, sharing photos and life experiences. Priscilla wants, “. . . other adoptive parents to know that adopting allowed me to truly feel fulfilled as a mother”. She wants birth parents to know that, “I needed to follow my heart to complete my family. Adoption laws have changed and Catholic Charities will be there to help you with your search. You should search, regardless of your fear and anxiety about reuniting. It’s possible to find your birth child and experience the joy that your heart has been missing”.